← What other .308 autoloader can be deployed rapidly from a subcompact car? SU16D12 The rail was designed by a Kel-tec employee and is one of several made for evaluation. The carbine can be fired with one hand if necessary and runs great with the 60-round Surefire magazine. I’d probably prefer a lighter 20-rounder for vehicle use, but 60 rounds are nice to have if you have to dismount without web gear for spare mags. Parallax free EOTech helps get hits on the move. This entry was posted in rifle, self-defense, weapon and tagged 223, car, keltec, NFA, red dot, short, SU16D. Bookmark the permalink. 24 Responses to Don’t end up like Reginald Denny. I would like to have a rifle for a car gun. However, I would be interested in suggestions on how to secure it from theft, yet keep it somewhat accessible. Thank you for the great photo blog. Either use a rigid locking holder similar to those in cop cars or, better yet, bring it with you when driving and take it away when exiting the vehicle. Short, foldable guns can fit in very discreet cases. Does the SU16D fold? I know the other versions do, but I’ve never seen a photo of one with the M4 type stock that was folded? It won’t fold completely with the pistol grip stock. unfortunately, many jurisDICTions do not allow a long gun and ammo to be in the same compartment unsecured, and in particular definitely not loaded (a minus for the KSG)… even with CCW. anti-poaching laws. go figure. but i believe, many will permit a magazine fed rifle to at least be available “up front”, as long as the magazine is not inserted. this varies wildly though, so, you know, check those local laws. people have been apparently busted for say, using their vehicle to “sight over” or even for having a loaded rifle too near / leaning against their truck. geez. some states are fighting this madly, and one in particular will hopefully soon at least allow “cruiser ready”. Reginald brings up a big point – and to add some gasoline to the fire, loaded firearms within reach are a serious nono for commercial drivers like Reginald Denny, regardless of local law – see Title 18 section 926a, Chapter 44, the so called “peaceable journey law”. There is nothing in the US Code, DOT regs or other Federal reg that says a “Commercial Driver” operating a “Commercial Vehicle” cannot have a firearm in their personal possession – subject to the laws of the state in which they’re operating for storage and use (ie. 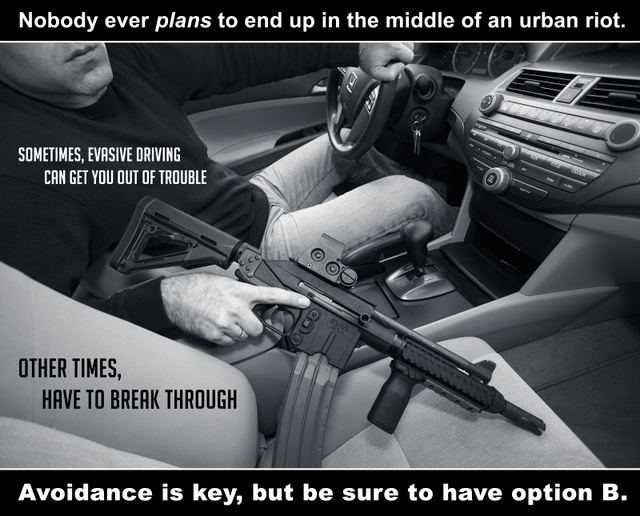 securely locked, carry permit, etc…). The “peaceable journey” law is what ALLOWS this, not prohibits it. So long as the state they’re traveling into/from allow them to possess it — there’s nothing illegal about it. In OH, if you have a CCW, you can have a loaded gun in the car, and (as of Sept 2011) it doesn’t have to be in a holster on your person: making long guns viable. But not if kids are in the car. Also, I have been lusting over each and every one of these SU16 SBR setups you’ve been posting…. This is, I fear, a timely reminder, given the political hysteria surrounding recent events in Florida. Well i’ve been a law abiding truck driver for 15yrs and i care not one wit what any state law says about weapons in the truck. I’ve traveled the east coast and mid west to the mississippi with no problems,and i’ve always been prepared. Shall not infringe says it all in my mind. Live life as a Free Person dammit. In PA< it would be illegal. unless it was an SBR. SBR, SBS, MG's… those are firearms, not rifles / shotguns. I know… its weird to even type that, but there is a difference in PA law for longguns and the others. I always thought the 20 ton truck would have been far more effective as a defensive tool than a firearm. Just press the damn gas peddle. Taking SBR’s across state lines opens up another whole mess of issues. Stop being so ubercompliant and just do what you have to. Hide the damn thing and stop being afraid of every stupid little law there is, most of you are your own worst enemy. Make up your mind to get a gun, learn to use it without fear, and then carry the damn thing everywhere you go. If you can’t do that, you really don’t need one anyway. Denny would be screwed if it happened again today – he’d still be in Los Angeles. No loaded guns in the passenger compartment, no unlocked guns in the passenger compartment. Best option here is simply DO NOT STOP. Best option is to pick the largest group, gain as much speed as possible before reaching them, and remove them from the gene pool. Honk the horn(fair warning), step on the gas, gear down and engage 4WD as req’d. Also take a look at the KT Sub-2000. Variety of cals and mag configs and folds to fit in a small “briefcase”. Good rifle for a bug-out bag if one is so disposed.